Tour 2016 was the third tour of popular French TV show called Danse avec les stars, which runs on TF1 channel every fall (the fall 2015 was season 6). The TV show is a French version of British Strictly Dancing format (Dancing with the Stars in US). The first tour (2013-2014) was so popular, that soon after it finished, a new tour was announced Tour 2014-2015). The third tour was announced well in advance, during the season 6 of the TV show. For those who are interested of more personal view of the tour, don’t forget to read RMJ‘s report of the tour. RMJ attended three shows, one in Brussels and two in Lille. The report you can find at: Report from the Danse avec les stars Tour 2016 (Brussels & Lille). This year the tour had total of 28 shows, of which one was held in Belgium (Brussels), and rest of the shows all around France. Like on the last tour, the opening city was changed again. This time the first two shows were held in Marseille. Also different to the first two tours was that the first city hosted the shows after New Year, and not just before Christmas. Earlier, after the first shows, there were couple weeks of break on the tour. Before the dance show in Nice, the dancers and judges took part of La bataille des fleurs (“Battle of Flowers”) during the carnival of Nice. For Tour 2016 Alizée (winner of season 4 and tour 2013-2014) joined as a guest dancer with Grégoire Lyonnet (who also performed some dances with professional dancers, being professional himself). This meant that her role was a little bit different this time. She had only one solo dance with Grégoire (normally the competitors have two dances, one for each half of the show) and this one dance didn’t receive the ratings from the judges. She simply left the stage after thanking the audience. Apart from this one dance, she participated in some of the group dances (in “Harry Potter / Alice in Wonderland”-dance she played the main role on the middle part of the dance). Starting from Nantes, she also took part of the final dance of the show as a singer (singing Fame by Irene Cara) along Priscilla Betti. Alizée couldn't be voted because she participated as a guest on the Tour 2016. She attended both of these shows. This year started dramatically when Tonya Kinzinger (season 5), one of the celebrity dancers, got injured the night before the opening show in Nantes. The injury was severe enough to put her aside from the whole tour. After the shows in Marseille, an interview of Alizée was released on TéléStar, where she told that she was asked by Chris Marques to replace Tonya. For Paris shows it was unclear if she would do that, and her announcement of change of choreography suggested that she was going to do it. Strangely enough, in Paris only two things changed; she was introduced at the beginning of the show like the other celebrities (for some reason this did not happen in Marseille and Nantes) and her solo dance Charlestone (first danced on season 4) dance was changed to Rumba (a completely new coreography). Eventually, she did not take part of the competition in any shows. In some shows (such as the second show in Lille), on the introduction for her dance with Grégoire, the host told that “Alizée was on the tour just for the passion to dance and not to compete with the other celebrities”. Alizée took part in all except one show (the afternoon show in Lyon on 27th Feb), even though originally at the beginning of the tour she announced that she would have to skip four shows. At the end, due to changes to her schedule, she was able to attend the shows on 19th and 25th of February, the dates she originally told she could not attend. On 27th of February, she performed a miracle and somehow managed to get back to Lyon on time for the evening show. The morning show she had to skip because she was in Paris for recording of new “SuperKids” TV show. So, at the end she only missed one show during the tour. Apart from Alizée, the other celebrities this year on the tour were Rayane Bensetti (winner of season 5 and tour 2014-2015), Loïc Nottet (winner of season 6), Priscilla Betti (runner up of season 6), Olivier Dion (third on season 6), Fabienne Carat (season 6), EnjoyPhoenix (season 6) and Brian Joubert (season 5). On this tour, each show had only four contestant because of the injury of Tonya, who was supposed to be the fifth couple. There were five exception, on which the show had five contestant: Brussels (4th Feb), the first show in Rouen (19th Feb), two shows in Lyon (both on 27th Feb) and the first show in Toulouse (4th March). Alizée obviously continued with the same partner as always, Grégoire Lyonnet, to whom she is engaged since 2015. The other professional dancers this year were Denitsa Ikonomova (for Rayane and Loïc), Christophe Licata (for Priscilla), Katrina Patchett (for Brian), Maxime Dereymez (no partner because of Tonya’s injury), Candice Pascal (for Olivier), Julien Brugel (for Fabienne) and Yann Alrick Mortreuil (for EnjoyPhoenix). The judges changed a little and this time there were four judges. Jean-Marc Généreux, Chris Marques continued with Jaclyn “Jackie” Spencer like in the previous tours. The fourth judge was Fauve Hautot. The role of the judges remained also the same, they are just there to make the show more interesting. The winner of the show is actually selected by a public voting. 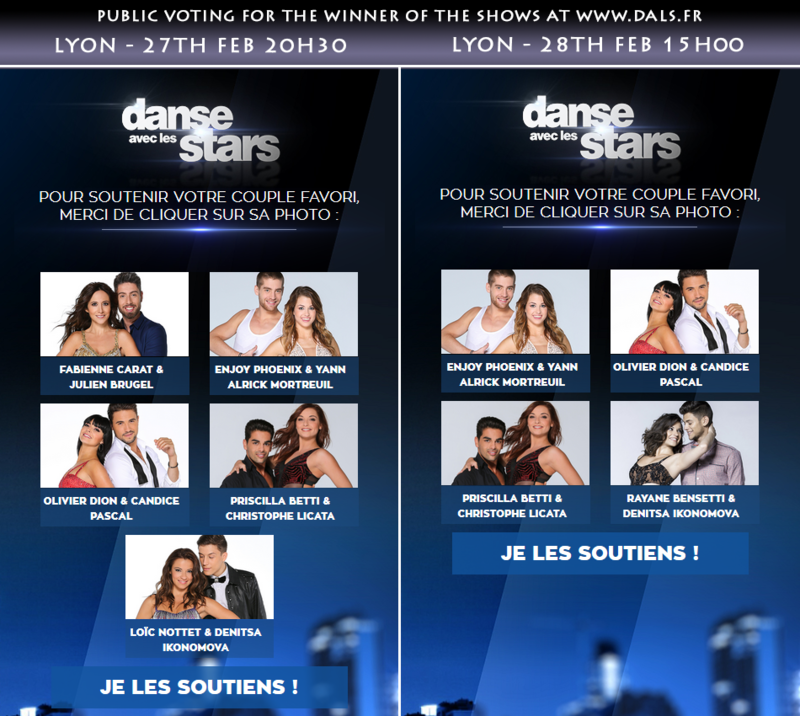 Like on the last tour, this year the public was done through the website (www.dals.fr). Alizée appeared on the site for brief while during the first show in Marseille. And made second short appearing during the confusion of first Paris show. Apparently the web staff wasn’t informed well enough her participation either. On every other show she was missing from the voting page (which now is obvious as she was just a guest dancer). The opening show was held on 9th of January 2016 at Le Dôme de Marseille in Marseille (in Côte d’Azur or French Riviera). This time the usual Christmas break was left out and the tour started later than before (after New Year). To Paris, which usually is the most awaited location, the show returned on 22nd of January, at Zénith de Paris like in earlier years. On this tour, there was much competition during the tour, even though Rayane kept dominating it by winning half of the shows. The competition of the second place was much more tight between Priscilla and Loïc. For Loïc we should add that he won almost every show he attended to (five out of six). If he had been able to participate on more shows he could have given a fair competition to Rayane. Rayane and Loïc never danced in the same show, which might have been intentional (Rayane replaced the shows Loïc couldn’t attend). On the fourth place came Olivier , who now have two victories, one from Lyon and the other one from Toulouse. See below the full list of winners.